Eden Juron Pearlman is the Executive Director of the Evanston History Center. In her spare time she volunteers for Evanston Swims!, a partnership between YWCA Evanston/North Shore, McGaw YMCA, and District 65 to provide second-grade children in Evanston with free water safety instruction and swim lessons. 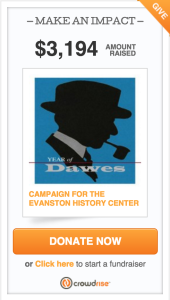 The Evanston History Center is entering the 21st century – who would have thought that EHC would be hosting an on-line fundraising campaign? I certainly didn’t imagine that would be the case when I began work here (then known as the Evanston Historical Society) over 19 years ago. The crowdfunding campaign was launched on February 1 and will run through the 29th. Our goal is to raise $29,000 ($1,000 a day.) We have a donor who has generously agreed to match every donation dollar-for-dollar up to $29,000! So all your support counts double. As you know, EHC is headquartered in the Charles Gates Dawes House, a National Historic Landmark. Dawes, who served as U.S. Vice President, Brigadier General in WWI, received the Nobel Peace Prize and called Evanston home. He loved Evanston and made provisions to have his house be the repository of our extensive history. The Dawes House contains the history of ALL of Evanston, and its programs reach into all parts of the community. EHC provides a historical look at the Dawes family’s life in Evanston through tours of the house and exhibits and cares for an extensive collection of Evanston history materials, including artifacts, costumes and research resources. EHC is preserving this invaluable treasure by raising $4 million through a capital campaign. Money raised from this campaign will help fund important infrastructure enhancements to the Dawes House, such as installation of geothermal heating and cooling to stabilize the climate in the house and conserve energy. Money raised will also be added to an endowment to address future maintenance needs. 1. Make a donation – it’s easy and has a big impact. 2. Help our campaign go viral! Share the campaign link with your neighbors, family, and co-workers, anyone you think might be interested in supporting EHCs work. Find us on facebook, twitter or Instagram (if you use them) and share the campaign via social media. Thank you so much for your support! With your help, we CAN preserve Evanston history for the future.